You can send RSSI via a spare channel in PPM or SBUS, and display it on your OSD (Betaflight OSD and MinimOSD). This trick applies to any Frsky receivers with telemetry, including the R-XSR, XSR, X4R-SB and the D4R-II. However one since the RSSI signal is PWM, a digital form, you need a low pass filter to convert it into analogue voltage level. I didn’t use one and just connect them directly, it works, but the RSSI data is pretty inaccurate I must say. It changes very infrequently, and basically only jumps between 0 and 100. Also RSSI pads on the receiver often tend to be very small and difficult to solder to. Apart from getting this info from the telemetry port, I also recently found another way of getting RSSI value, which is more accurate, and no additional wire and soldering. If you are running PPM, and has a spare channel, you can assign this channel RSSI and send it back to your RX. Then you can configure your Cleanflight to recognise this channel as RSSI value. Finally you can setup the MinimOSD to get RSSI reading from Cleanflight, and display it. The setup is the same for both Taranis X9D and QX7. First of all set up a input in Taranis. I call it “rssi”, and choose “RSSI” as the source. Leaving all other settings as default. Setting Scale to 100. In Mixer, we choose a spare channel, in my case I chose Channel 7. If you are not sure and don’t want to upgrade firmware, just use 6 or fewer channels in PPM. I name it “rssi”, and I chose the input we just created which was also called “rssi” (it has an highlighted “i” icon before the name). Note that a channel output should have range between -100 to 100. With default weight of 100 and offset 0, the RSSI channel output will only be 0 to 100. Therefore I have made Weight 200 with offset -100. And now if I turn on the receiver, we are getting a pretty strong signal. Important Note! (12/07/2015) With Frsky D4R-II receiver, make sure you have the latest firmware installed to use more than 6 channel PPM. Basically with the old firmware, where the signal width was 18ms, it caused problems when you use more than 6 channel in CPPM. The new firmware resolved the issue by using 27ms signal width. Some shops sell the RX with new firmware, check with them first. We need to tell Betaflight/Cleanflight, that we are passing RSSI via a PPM or SBUS Channel. In the Receiver tab, and choose the AUX channel you are using for RSSI. If you are using channel 8, then this will be AUX 4. Once you have saved it and restarted the FC, and you should see the RSSI in the Setup page. You can confirm this in the Receiver tab as well which is showing RSSI in PWM signal (1000-2000). Basically you just need to enable “RSSI” in the OSD tab. Simple as that. Learn about setting up Betaflight OSD in this tutorial. Warning: make sure failsafe for the RSSI channel in the failsafe tab in Betaflight is set to “set” to a value that indicates a signal lost (say 1000 which is equivalent to 0%). If you leave it on “hold” the RSSI value on OSD is going to get stuck on the last value before the failsafe. It might not even reset when you get your signal back. 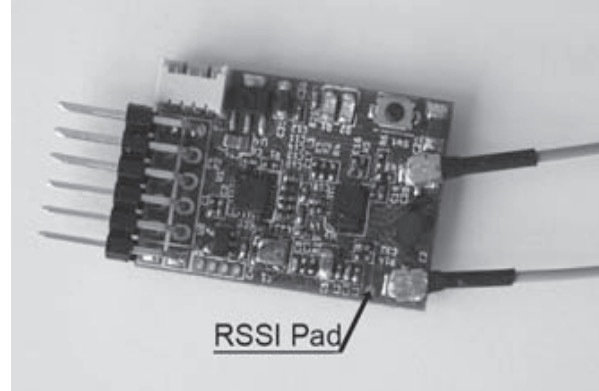 If you are using MinimOSD with MWOSD firmware, you need to enable option “Use FC RSSI”. Also RSSI Max has to be changed to 255, and Min to 0. NOTE (16/Apr/2016): From MWOSD 1.6, the Max RSSI has been changed to 1023, no longer 255. Check on the receiver tab which AUX # your RSSI signal is. After that go to the failsafe tab. All AUX channels are by default set to HOLD, they will just keep the last value when you switch off the radio. Set the correct AUX channel in failsafe to SET 1000 and save. After this is done the RSSI will show 0% if your radio is off or when the link is lost. Everything worked as described except for the last step, where I should see the RSSI % in the BF Setup tab. Must be either mybnoard or that firmware it is running. Just wanted to point out that you need RSSI_ADC turned off in the Configuration tab in Betaflight or else you will get an incorrect RSSI value. Has anyone done this in iNAX 1.8 yet? The FAILSAFE tab does not show/allow changing the AUX configuration, and I don’t see it in the GUI. Command Line may work via “aux …”, trying to find documentation. Hi Oscar! when i’m running a EZUHF RX together with an EZUHF JR module on the taranis i don’t get the RSSI choice under “inputs”. Do you know how to set up an RSSI channel then?? With EZUHF you don’t need to use this since you can enable RSSI/LQ within the EZUHF software. In the software select what SBUS/PPM channel to use for your RSSI/LQ output. Once assigned, you’ll configure BF and the OSD as described here. Thank you Oscar. Worked great on my QX7 and XSR receiver. Appreciate your easy to follow tutorial. Please add Edgar’s information to manual – Fail Safe settings when RSSI is send back to FC. Its quite important. I had an accident when I lost signal and I didn’t knew about that – RSSI was frozen at 57,… sticks was frozen too… whoops… [email protected]#$! . “Check on the receiver tab which AUX # your RSSI signal is. I’m trying to find out what I should do to get the RSSI on my OSD with my Kiss and X4RSB setup. Normally, I connect the sbus connection to FC with the Smartport to TX and I get the telemetry on my both Taranis and OSD. What else do I need to do anything else to get the RSSI? I saw some people solders a cable to a little pad next to the antennas on X4RSB. Do I need to do that? Sorry i don’t know about KISS, i don’t think it’s possible to send a RSSI signal to the FC via a RX channel. i know its abit late but you need to select the option DISCOVER NEW SENSORS in the menu. This really needs to be added in the above tutorial for later versions of OpenTX….it would have saved me a LOT of time….also that in order to Discover NEW Sensors, you have to bound to the RX and both TX and RX on…. Thank you very much for this setup tutorial!. I looked everywhere to find information on activating the RSSI value in MWOSD via Naze32 using my hardware. Other information I found was either way over the top in terms of complexity or extremely vague and convoluted. I have to say I was sceptical at first but I followed your advice exactly and to my relief and joy it worked exactly as you described!! Thank you again for sharing your knowledge and writing fantastic articles of substance . Much appreciated. When setting up the INPUT scale, the newest OpenTX now lists dB as the units of scale. My D4R-II is using 8 channels just fine, but the RSSI scaling does not match your results. When RX is powered, RSSI on the telemetry page of the Taranis is about 96dB. When I unplug the RX, RSSI on the telemetry page of the Taranis falls to 76dB and then stays there in [square brackets]. It seems the Taranis is remembering the last know RSSI and keeps that value in the Inputs, which in turn is pulled by the mixer and prevents updating the channel 8 RSSI signal going back to the receiver. Any suggestions? Will this work with the X4R-SB receiver as well when using S-Bus ? Many thanks alot for the RSSI at 1023 on MWOSD 1.6 !!! Hello oscar. How can we do this with Radiolink AT9 R9D ? This is exactly what I needed to get RSSI on the BeeRotorF3 FC with a D4R-II RX. Thank you for your work! I am a total noob and can’t find a solution to this problem anywhere. My problem is when I go to enter the “source” in the mixer selection, there is no RSSI option. Is there an easy fix to this? An upgrade or download I am missing? Any help is appreciated. Hi Oscar, I figured out why the RSSI values were locked at 100% on the minimosd. I am using MWOSD 1.6, BetaFlight 2.5.3 and changing the RSSI max setting in MWOSD to 1023 fixed it. So not 255, it should be 1023. Thanks. On last firmware of Taranis you need to go to telemetry and slect discovered new device to find RSSI, if not you will not have in source. when it is done you can find it. discovery should be done when quad is power on, mean RX receptor power on. Do you think I can get the same result using a Turnigy 9x with er9x installed please ? If i want to power the micro minimosd module with an external regulator, which wires should be removed? Do i need a cap on the regulator output? regulator is a polulu 5V, 5A. And also i have one battery for frame and second for vtx, which one should i use for regulator? because i burned a minimosd in the past when i was trying to use the same battery for both. Hi Oscar, I followed your instructions on configuring my Taranis Plus to provide RSSI to my miminosd. I am using a FRSKY D4Rii in PPM mode. I flashed the D4Rii to the current firmware. I assigned RSSI to chan 7. I see the RSSI value in BetaFlight 2.5.3, and I can see the values change in the receiver screen and setup screen. I configured MWOSD per your instructions. But, my Fatsharks show RSSI at 100% always. I can change some of the values in the mixer screen and my Fatsharks will display 0 %. No active reading however. I am out of ideas. Can you show me how to setup on the Futaba Transmitter? To get the RSSI from PPM Channel like you Show on top? is the RSSI signal on this pad a PWM signal or analogue voltage level signal? Hi Oscar I got this working thanks to your guide but the % values shown in the MW OSD are strange. 49% (flashing) when first powering quad (taranis OFF). 90% once I turn on taranis – it goes up & down a bit as i move around, looks like it’s working. Turn off taranis & the % freezes on the last value. Hi Oscar – re “Turn off taranis & the % freezes on the last value.” – it also does this in the Cleanflight receiver tab, aux3 will freeze on the last value when turning off taranis. After this is done the RSSI will show 0% if your radio is off. normally you can just hook up a buzzer to the flight controller, and it can be configured in cleanflight to be activated using a switch, or lost of radio signal, or low battery level. have you ever used a naze32 board before? I have setup channel 10 as rssi input and output like you have here and confirmed i get the right figure when tx is at 100 percent and also when its switched off. the rssi out on the x8r doesnt work so im trying this method here. i connected a servo lead from channel 10 to the sbus on the pixhawk (rssi in) with the voltage wire removed, I have set minim osd extra to read mavlink data on the RSSI option. but i am still getting pulsing inacurate figures. Have you tried this with OpenTX 2.1? I’ve upgraded mine to 2.1 which unfortunately doesn’t have RSSI as option for Source.. :( is there any other way to get RSSI as Source in OpenTX 2.1? from the RSSI screen you have to first SCAN FOR SENSORS, it will then detect your telemetry and enable all those outputs. I had the same problem and found that this is the recent change. Thanks! This combined with Vbat out from the nase32 makes the KV team minimOSD mods almost moot. For me this is great as I have a defective board that the seller (FPVmodel) doesn’t want to reimburse me for. I have a normal minimOSD board from an Ebay seller I will use instead… after desoldering from PDB. Yes Carl, i feel the same! Is it possible to do this with er9x firmware? Same here! I can’t get RSSI from tx directly into micro minmosd, when the signal wire is plugged the OSD freezes. I want Instead get RSSI on PPM Channel, but like Javier, no taranis here, any idea how to perform this into TH9X? Without RSSI the d4r is for my currently project useless. Many thanks for all those tutorials. Forgive the noob question but can the same process be used to send RSSI over an Sbus channel on the X4R-SB? It seems analogous to send via a PPM channel. Yes I think it should work as the setup on your Taranis is the same… only different is how you set it up in Cleanflight… sorry i don’t have a SBUS compatible RX and FC to test this at the moment. I have already a Taranis with X4R-SB. I have followed all the steps but comparing both values of RSSI (the own Taranis RSSI lecture, and the calculated by the CH7) and they have huge differences. Have you already tested in this enviroment? Thanks Oscar for your help. Hopefully someone can answer this for me. I have been flying my quads with my Futaba heli radio, but I am moving everything over to the Taranis. I have RSSI setup properly on channel 8. In Cleanflight I can see my battery voltage, current draw and RSSI says 99% or 100%. My issue is when I go in to Companion TX or on the radio itself, on page 12 which is Telemetry on the radio and screen 1, there is no Cell or Cells choice. There seems to be no real FC/Quad telemetry choices to choose there most of them seem related to the radio. Looking at your screens above and a couple of videos, these should be a choice on the telemetry screen as well as others. Any idea what is going on? maybe you have an older firmware on your Taranis? Hi Oscar, before we proceed shouldn’t we upgrade firmware on D4R-II to 27ms firmware? i didn’t update firmware, all default and worked fine. Hi Simon, you are making a very good point, just checked mine and it’s got the 27ms firmware pre-flashed. i will put a warning up in the post about this issue! Hi Oscar, should I change anything with cables? Delete above comment. BTW your comments work quite strange on mobile. no no change to cabling. Brian, you can follow the direction here to upgrade your Taranis to the latest OpenTX version, which is at 2.0.17. It’s pretty easy. Interesting. I *swear* I had RSSI on my OSD working back under CleanFlight 1.7.something, then upgraded to 1.9.something and it went away with no hardware changes. I haven’t spent much time dinking with it, but I’ll give this approach a try. Painless360 also has a good YouTube video on the same topic. I asked a similar question on your related thread (below) but here it is again. You show how to setup the RSSI/PPM channel on the X9D Plus, however I have the standard Taranis X9D running on the original firmware that came pre-loaded when I bought it over a year ago (OpenTx-r2940, 02-02-2014). My problem is that (i) I don’t have the INPUTS screen on the original X9D firmware (just STICKS and MIXER), plus (ii) I don’t see RSSI (or other telemetry parameters) as an available source when setting up a new CH in the MIXER screen …. so I’m kinda stuck. I’ve read the original manual and there’s no mention of being able to assign telemetry parameters so suspect that I need to upgrade my X9D firmware to a newer version in order to make these features available … but if you think there’s a way to do it on my current firmware I’d be keen to hear any inputs. Upgraded my Taranis firmware so was able to configure my X9D as per the tutorial. RSSI now visible on my MWOSD. Thanks! Where did you get the latest firmware for the X9D? I looked on the Frsky site and its pretty old and matches what I have now. I have the same issue you seemed to have. did you also Update the D4r2 firmware…?? because i update taranis Firmware… and nothing change ? ?